No Fenders -Formula 1, IndyCar and A Whole lot more..: RETRO: Monterey Historics1994 - 20yrs later - Fini! RETRO: Monterey Historics1994 - 20yrs later - Fini! Continuing on with this magnificent trek to California's fertile grounds of A-L-L things automotive, my mind was about to be even more overwhelmed than the previous day's outing at Concourso Italiano! Today I’m off for Laguna Seca raceway! From my nearby motel, I take Reservation Blvd to the back gate, which leads through desolate Fort Ord. Passing the “shuttered” barracks, the two lane twisty road encourages those in front of me to begin driving at qualifying speeds before reaching the ticket-takers. 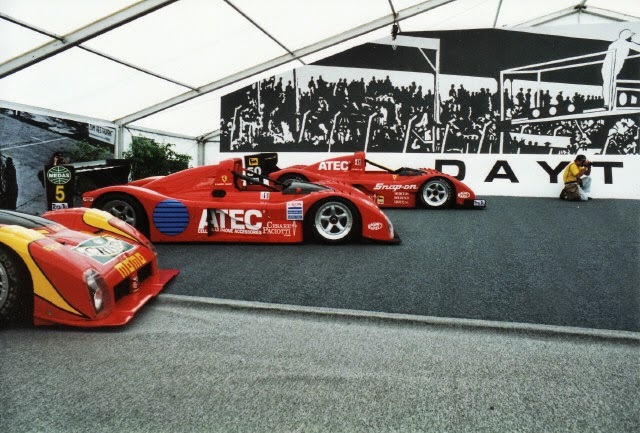 A small selection of Ferrari’s current street cars sit on display inside the tent: A brand new 456GT and two 355’s sit alongside each other, while a lone red 512TR sits orphaned in the corner, with more early machinery also residing nearby. 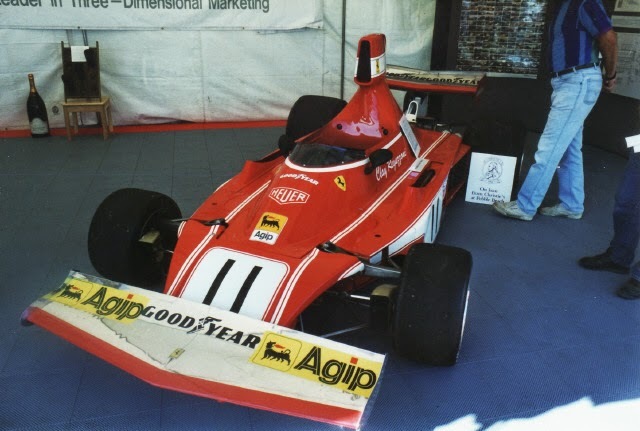 In the middle of the tent a 250LM sits parked with “le piece de la resistance!” As a large throng of spectators hover around the 1990 Alain Prost 641 F1 chassis. Standing alongside it, I mumble to myself how small & low-slung these rocket-sled’s are. (They look much larger on TV!) And that’s just the main display tent on the premises. Cruising the paddock area, I’m floored by the number of vintage racecars on site… Including what appears to be a sea of Ferraris! Noticing a gaggle of Shelby’s, I stop and briefly chat with Shelby GT 350 vintage racer John McClintock (Puyallup, WA) before checking out three Cobra’s parked next to McClintock’s and Jim Shield’s GT-350’s..
Next I cross over the “Flinstone” (Firestone) footbridge to the “Manufacture's Midway” to peruse the assorted vendor booths. Before lunch I climb up the steep hill which you need to hike in order to reach the famous Corkscrew turn. You know: The corner where Alex Zanardi would complete an astounding off road “bonsai” pass on the final lap to beat Bryan Herta a few years later, in what is known in Open Wheel Racing parlance simply as "The Pass!" As this breathtaking maneuver culminated with Championship Auto Racing Teams (CART) creating the “Zanardi” rule," i.e. ; not being allowed to pass with all 4-wheels off of the racetrack! And what a most impressive corner, indeed! Screaming up the hill, Racer’s aim for a tree while entering the blind crest that leads into the Corkscrew. Then the cars plunge down the 3-story undulating drop towards the pits… As the view is fantastic from here also. I watch the lunchtime activities of Ferrari parade laps which seem to feature many production model Ferrari’s including two F-40’s. Then over the PA system I listen to the interview with 2 time F1 World Champion Niki Lauda. (Hmm? Apparently they didn’t wish to mention his 3rd title since it was in a McLaren-Porsche, eh?) about his Ferrari consultancy job and what he thinks about Ferrari’s recent win in the German Grand Prix? Niki claims he’s never been to Laguna Seca before. So, I’ll take the 456 out to learn where the lefts & rights are… Then I’ll drive my ex-F1 car around a few times. It’s really fun watching Niki pound around. On the second time through the Corkscrew, Lauda is hard on the gas… And the sound of the 456’s front air dam can be heard massively scraping the FIA curbing. Niki’s hard on the accelerator, shifting gears with tires squealing in search of adhesion…All this while Niki’s chauffeuring 3 very fortunate guests while learning the track’s layout; Hooah! Afterwards the Saturday race sessions begin with the oldest, “slowest” race groups. Afterwards, the first 2 races are followed by two Ferrari tribute laps for Luigi Chinetti where a Ferrari 206 SP grinds it’s nose by running too close to the Corkscrew’s curbing! The next race sees Phil Hill flogging someone else’s poor Bugatti! Every time by, the Bugatti’s tyres squeal loudly in protest from Phil trying to go too fast! With another of the multitude of celebrities on hand, “Blackjack” (Sir Jack Brabham) participates in the racing - while Phil Hill jumps into a Ferrari 212 and simply “motor’s” away from the next race group. Group 5A provides the best racing action of the day. A 1958 Ferrari 250 TR spins in the Corkscrew. While trying to save the car, the driver vainly overcorrects and spins another three times across the entire track before coming to a complete halt! Finally it’s time for my favourite race group, Group 7A: 1966-83 Formula One cars! (Saturday’s final event) Where else can you hear the sweet sounds of three Ferrari 12-cylinder engines singing staccato? Bruce McCaw is piloting the ex-Niki Lauda 1976 312T2. David Livingston drives his ex-Jacky Ickx 1969 312 with another ex-Lauda 1973 312B3 in tow... As these 3 Musketeer’s are chased by another dozen + Cosworth DFV V-8 powered chassis. What a truly wonderful site! Upon driving back to the motel totally “jazzed: from the day’s activities, I decide another venture to Monterey is required. Approaching Seaside on Highway 1, I slow down to allow oncoming traffic to merge. A red Ferrari 328 GTB darts directly in front of me… Dumbfounded by the sight of the Ferrari, I quickly roll down the window. While savoring the sounds of the V-8, I find it extremely bemusing to watch the 328 effortlessly vanish from my sight while accelerating to 100+ mph when trying to follow it! I drive through the morning fog towards Carmel, turning onto the famous 17 mile drive and follow the twisting two-lane road past mansions galore, with “Beemer’s, (BMW's) Mercedes-Benz’s and Jaguar’s parked in their driveways. As I follow the road down to the golf course on the ocean and I’m there! The parking lot is filled with Ferrari’s, Porsche’s, Pantera’s, etc. Passing by the golf pro shop and other building’s I arrive at the concept car display. There’s four Chrysler’s, three mid-1980’s Ford Ghia’s and the Bentley Java still under cover. There’s also six priceless Ferrari’s on display, while parked on the manicured lawns is that silver “loaner” Ferrari 456GT that Niki Lauda “flogged” the previous day at Laguna Seca! Next, I walk past three people furiously polishing a bare aluminum Bugatti: Type 51/57? While alongside sits a blue Bugatti Type 31. Then I walk through the AFAS tent (Automotive Fine Arts Society) and marvel over the awesome artwork! My favourite is the 3-foot X 5-foot acrylic on canvas dark blue Viper GTS by Jay Koka for the ultra low price of $4,800.00; SHEISA! Back out into the glorious California sunshine, I peruse the big “stodgy-podgy” trans-ocean liners… The rarefied “Grey Poupon-High Society” selection is flaunted by Duesenberg's, Cords and Cadillac V-16’s, while I’m enamored by an Auburn Boatail, but my enthusiasm quickly wanes as I approach a row of vintage MG’s. It’s tough work being a jaded, awestruck spectator after 3 Fantastic days of mind-blowing exotic automobiles, Eh! Sensory overload seems to have aflicted me after “eye-balling” the most awesome gathering of exotic Italian machinery I’ve ever seen at once, with Saturday’s racetrack action being nothing to snicker at either! There, at Laguna Seca, the president of Ferrari Club of North America speculated that this must be the largest gathering of Ferrari’s at once… When asked how many? He replied” Oh about a ton and a half! As in 1,050 or 1,500? Correct! 1,500+ Ferrari’s attending this weekend’s events; SHEISA! I make one last sweep through the Ferrari’s and notice how somehow the Chrysler & Ford concept cars seem “ordinary?" While the car cover has been pulled off of the Bentley Java. (concept car) What an awesome machine! Leaving the event, somehow jumping back into theChebbie' (Corsica) rental car seems anti-climatic as I hurriedly drive back to San Jose, or is it San Hose? Hya! To pick up Marcus at Shirley’s house. Dropping off the rental car, we check in and fly home. Coincidently after returning from Monterey, I notice that my September ’94 Sports Car International (SCI) magazine seems to coincide with the just concluded events attended. 3.5 liter V-8: 5 valves per cylinder. 6 speed manual transmission. 280bhp @ 8,250 RPM. 0-60mph = 5.6 seconds. Top Speed = 183 mph. Next up in the magazine, Crestley Crewe’s Missile: This year's sensational show car; The Bentley Java. While in the very back of the SCI rag' I notice an article on “Guess Who?” Bernd Michalak Work studio's Conciso… Hey, that’s the same funky car I saw in my motel’s parking lot! This Michalak Conciso prototype/show car cost approx. $150,000 and the Conciso’s curb weight = 2,150lbs. It’s Ferrari 3.2 liter DOHC V-8 pumping out 270bhp @ 7,000 RPM's propels it from 0-60mph in 5.8 seconds, with a top speed of 151mph; WOW! As this car was supposed to make it’s debut at Laguna Seca… Wonder what next year’s show will do to top this event? Having long since surrendered my most prized possession, my Driver's license due to my faltering eyesight, Shirley had Mark drive us to Carmel, Monterey and Oceanside in her 1986 Jaguar XKE! Hey, if Yuhs can't drive NO more, than at least Y'all should travel in style, right? As this is the last time I've been to some of my most cherished automotive hunting grounds! As I really need to go back again - pronto! And as typical in life, much has changed over the past 20yrs, including Concorso Italiano apparently outgrowing the Quail Lodge, or was it finances? As there's a different car show held there now - and quite a bit pricier! While Concorso Italiano has moved to Fort Ord. Also, it's not called the Monterey Historics anymore, since Steve Earle sold out 'N retired, with the event now being known as the Monterey Motorsports Reunion instead. 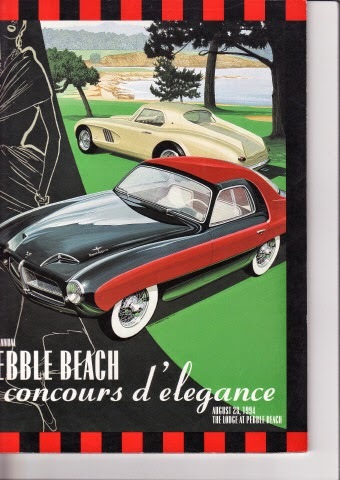 And the Pebble Beach Concours de Elegance, which should be experienced at least once has more than tripled in price since I attended; YIKES! As I know I've got my ticket stub that I seem to recall paying $80 for. (Or at the very most I paid $100) But don't have the time, inclination or effort to hunt for it... With 2014 event Pre-sale tickets now setting you back 275 'Smackeros, with day of show tickets costing $300! Kudos to long-lost friend's Roberto; purveyor of ALL things "FoMoCo," chiefly Shelby; also introducing Mwah to the De Tomaso marque, a la his AWESOME Pantera GT5! Along with wife Kimberly and daughter 'Cammee who coined the word 'Hystericals... And ex-boss & goalie Jeff, who insisted I really needed to experience the Monterey Historics weekend, confirming what Roberto had already told me. And lastly, major Kudos to Marcus, Shirley and his Dad for their hospitality, transportation & assistance during my two brief stays in California! Months after your post, I've found it. I, too, was there and traveled nearly the same footsteps; Concourso Italiano on Friday (as a vendor, trying to fund the weekend), the Historics on Saturday, (where I was passed on the back straight by Niki Lauda driving his Ferrari), and Pebble Beach on Sunday (where I was so awestruck when I realized that I was standing next to Adm. Alan Shepard and his wife that I forgot to take a picture). And did I mention I was passed by Niki Lauda in a Ferrari on the back straight? Well, I guess it was more like the gravel access road on the back side, but he was actually driving a silver 456 as he passed me while I tried to run with him in my cowboy boots in a frantic effort to get him to stop for an autograph...uhm...like I said...I was passed on the back straight at Laguna by Niki Lauda driving his Ferrari. I still treasure my slides of the same 512s you lusted for, the Porsche 917s, pre war Maseratis and Bugattis, and all of the open wheel legends and rare Ferraris I had previously only read about. Few people I know appreciate the rare opportunity the weekend provided me, and in retrospect, I appreciate it even more. I drove from my home in Denver, turned left at San Francisco, and camped in my tent at a KOA on the beach just north of Monterey. And I think you are mistaken; it was not a 206 SP that scraped the curbing at the Corkscrew during the tribute laps. My slide says it was the legendary 250LM #22 from the Indianapolis museum that bounced (yes, I said 'bounced' ) over the curbing at the bottom of the Corkscrew. My camera was at the ready to get a once-in-a-lifetime shot of a 250LM on a race track, and I got a little more than I had anticipated. Memorable stuff! I'm sure your memories are as bright as mine, even as your sight has dimmed. Although I have my slides, I don't really look at them any more. But when I read a post such as yours, I remember my own experiences in surprising detail. Thank you so much for sharing.